Asthma is a lung disease that causes difficulty breathing. 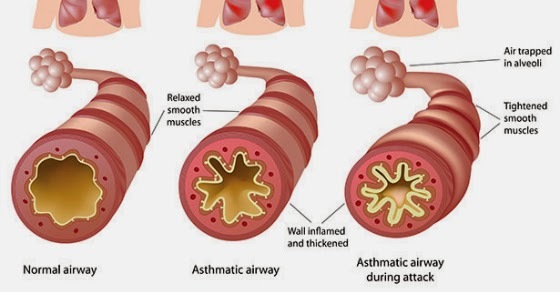 Asthma can be either acute or chronic. Asthma attacks occur when there is an obstruction in the flow of air in the lungs. Some common causes of asthma are allergies, air pollution, respiratory infections, sulfites in food and certain medications. Common symptoms include coughing, wheezing, shortness of breath and chest tightness. There are many medical treatments for asthma. These simple natural remedies can also provide relief from symptoms. Ginger is a well-known natural treatment for various ailments including asthma. Researchers have found that it can help reduce airway inflammation and inhibit airway contraction. Plus, studies indicate that it has compounds that may enhance the muscle relaxant effects of certain asthma drugs. Continue this home treatment for a couple of months. This method helps the nutrients quickly enter your bloodstream and provide relief from asthma symptoms. The following garlic remedies will clear congestion in your lungs, giving you quick relief from asthma symptoms. Boil 10 to 15 cloves of garlic in one-half cup of milk. Drink this once a day. You can also make garlic tea by adding three to four cloves of garlic to a pot of hot water and letting it steep for five minutes. Allow it to cool to room temperature and then drink it. The caffeine in regular coffee can help control asthma attacks because it acts as a bronchodilator. Hot coffee also will relax and clear the airways to help you to breathe easier. The stronger the coffee, the better the result. Honey is one of the oldest natural cures for asthma. The alcohol and ethereal oils in honey help reduce asthma symptoms. Just inhaling the smell of honey produces positive results for some people. You can also mix one teaspoon of honey into a glass of hot water and drink it slowly about three times a day. Before going to bed, swallow one teaspoon of honey with one-half teaspoon of cinnamon powder. This will help remove phlegm from your throat and allow you to sleep better. Onions have anti-inflammatory properties that can help reduce constriction of the airways when suffering from asthma. Also, the sulfur content in onions helps decrease inflammation in the lungs. Simply eat raw onions to clear your air passage ways for better breathing. If you cannot bear the taste of raw onions, try eating cooked onions. People with asthma often have low levels of vitamin C. Lemons are rich in this vitamins and antioxidants that can help reduce asthma symptoms. Squeeze the juice of half a lemon in a glass of water and add some sugar according to your taste. Drink this regularly to reduce asthma attacks. Oranges, papayas, blueberries and strawberries are also rich in nutrients that help minimize asthma symptoms. Note: Avoid using bottled lemon juice. Also, do not take citrus fruits during asthma attacks if they worsen your symptoms.